Everyday sources often provide inspiration for my blog. Yesterday, strolling down the main street in our local village after visiting the market, I noticed the wide variety of ornate door knockers (heurtoirs in French) in a short space. I returned today with my camera. It’s believed that door knockers originated in Ancient Greece, where slaves were chained to a ring on the door and opened it when a visitor arrived. The simplest ones I saw were bars of metal that you lift and drop onto a metal back plate screwed to the door or simply onto the wooden door itself. Metal rings, of different degrees of ornament, are also popular. 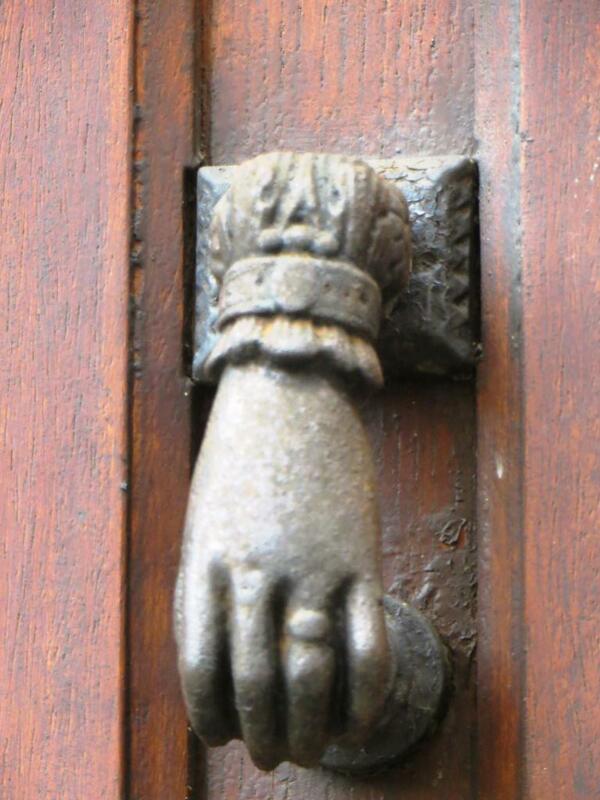 These door knockers in the shape of a hand holding a ball are probably the most interesting. The hand emerges from a lacy cuff, often with a bracelet around it, and bears one – sometimes two – rings, although not always on the same finger. They are occasionally made of brass but more often of iron. The hand and the number five figure significantly in Arabic, and also in Jewish, tradition, and are particularly associated with warding off the evil eye. Fatima Zahra was the daughter of the Prophet Mohammed. Hence, the occupants of a house with a door knocker in that shape were protected against evil. Originally, they also showed that the occupants were of the Moslem faith. I understand Hand of Fatima door knockers are found extensively in Spain, which was under Moorish occupation for centuries. Some of the Moorish cultural influences penetrated as far as southern France, which is probably why you find them here, too. However, those you see today are probably 19th-century reproductions. I would be interested to know how widespread they are further north in France. 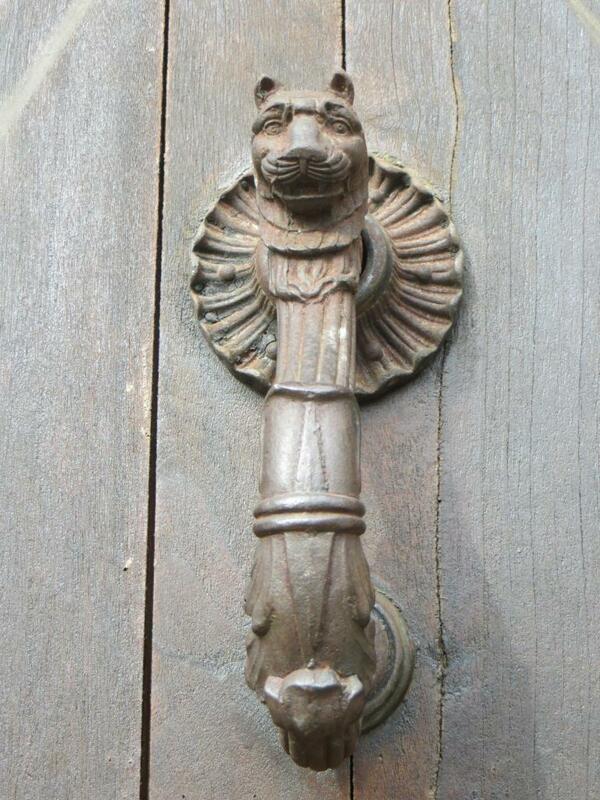 Lions’ heads figure extensively on door knockers and probably have a significant symbolic meaning. The winged lion was the symbol of St. John the Evangelist, and so could have had a protective function. Equally, the lion is a symbol of power and authority. I’m not really sure if the one above depicts a lion or a cat. I also found one in the shape of a swan’s head and neck and another of a bare-breasted woman. The latter in the example below is no doubt a modern reproduction, has clearly been added later and doesn’t match the rapper beneath it. But I wonder if putting a sign like this above the rapper would once have signified the local maison close (brothel). If you have other ideas, please leave a comment below. This entry was posted in History and tagged Arabic tradition, door furniture, Door knockers, door rappers, Hand of Fatima door knockers, heurtoirs, Moors in Spain, SW France. Bookmark the permalink. I think this is a fascinating read, in the light of my last post! I have only recently found your blog & I came across this post via your entertaining Christmas quiz! I didn’t know about ‘la main de Fatima’ but I have some photos that I took in Castelnaudary of a door knocker very reminiscent of the ones in your post. 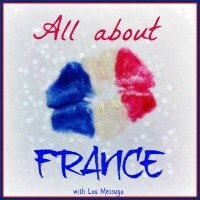 I will reblog your post on http://www.fancyingfrance.wordpress.com Merci beaucoup! Thank you! It’s interesting how a subject for a post just hits me out of the blue. 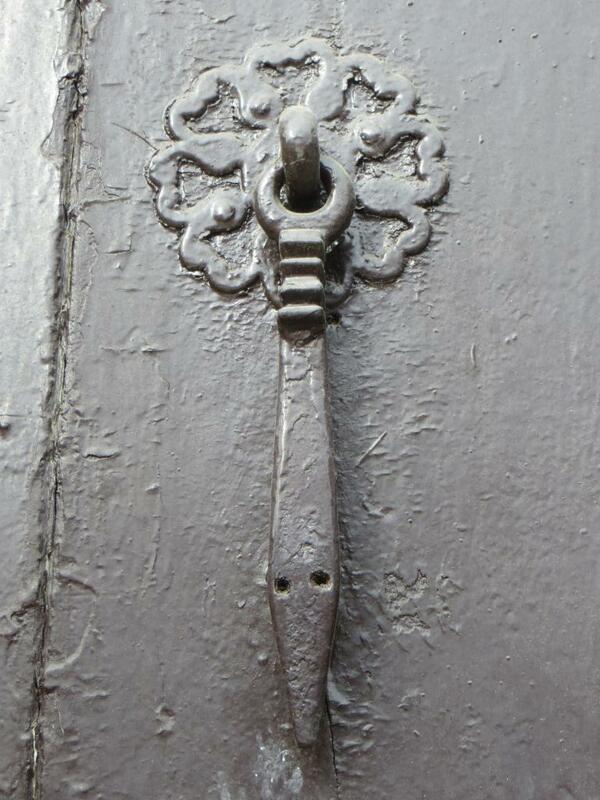 In this case, I just happened to walk down our local village street and noticed the variety of door knockers. My nearby small ‘town’ had some beautiful examples of these hand and ball knockers, so I went one day to photograph them for my blog. Most of them had gone (antique dealers? ), and I found just one that was still in place. What a pity. Perhaps someone went around nicking them all? When I was researching them, I saw a lot for sale on the internet. The brass ones in particular can fetch quite a price. The hand of fatima, whodathunkit? Seen many examples around here and am known for my door photo fetish. 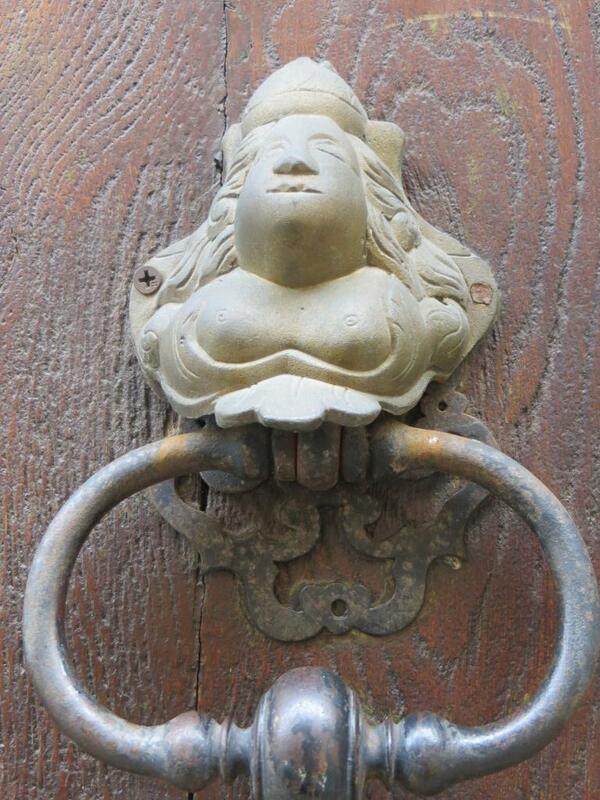 I shall be looking at knockers now. Thanks for bringing them to my attention and the related information. Amazing how much inspiration can be conjured up out of something so mundane. I do wish, though, that the word knockers were not now associated with the female anatomy! What a lovely post, door knockers. We only seem to notice them when we need one to let the occupants know we need their attention – open the door please we are here. I shall certainly look more closely in future. It is such a shame that in all of your pictures the actual knockers are in dire need of some tender loving care, I’m sure they would look even more attractive. Ostensibly, it doesn’t seem a promising subject to blog about, David. But when I saw how many varieties there were in a short distance, and then did some research, I realised there was much more to the subject – as is often the case. When I took the photos, I’m afraid I concentrated on houses that didn’t appear to be inhabited, either temporarily or permanently. I didn’t want to be faced with an irate owner, outraged that someone was photographing their house! I was disappointed to see that some of them had been painted over and that others needed a good application of Brasso. You’ve got me intrigued now – I shall spend the week peering at doors to closely inspect their knockers. I will report back on Fatima’s hands but I suspect they are not a feature here. 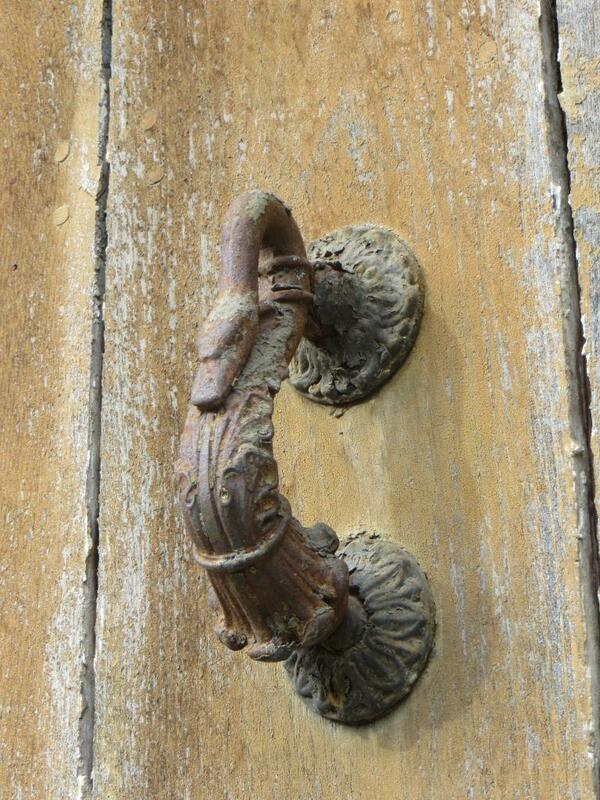 Love the knockers knocker even if she is a reproduction but my favourite has to be the Swan – such an elegant idea. It had never occurred to me to look at them until I noticed them when I was walking down the street. I like the swan best, too.I’ll be interested to know if they have Hand of Fatima knockers in your neck of the woods. Someone I know in Venice says they have the Hand of Fatima ones there, too, but the lion’s head is more prevalent. I love the swan’s neck too – clever idea. I like the idea of the posters as well.